First we have a poster to share. I’ll be reviewing this one very soon. 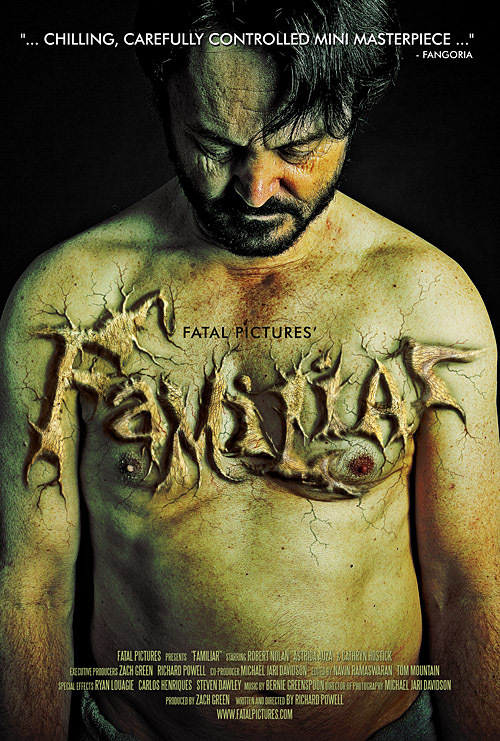 But until then, check out this awesome poster for Fatal Pictures’ FAMILIAR, which will be touring the festival circuit this fall. I can’t wait to check this one out. Looks Cronenberg-ific! Read full article here. Since its creation in 2007 Fatal Pictures has produced two short films. CONSUMPTION in 2008 and WORM in 2010. Below is a comprehensive profile of each film and their achievements to date. Made available are a list of reviews, awards and press/interviews. Further information including full cast and crew credits, additional details and reviews can be found by following the links provided for both films IMDb and FACEBOOK pages. A day in the mind of Geoffrey Dodd, a seemingly kind, gentle and sane High School teacher. As we follow Geoffrey through the course of a typical school day we gain an eerie insight into the darkest corners of his soul and beyond. Beneath the carefully constructed veneer of Geoffrey Dodd lies something wretched, insidious and foul rotting him from the inside out. "AUDIENCE AWARD FOR BEST PERFORMANCES"
"AUDIENCE AWARD FOR BEST SHORT FILM"
After weeks of online communication Claudia and George are ready to meet face to face.What appears as a simple date quickly turns sinister and shockingly graphic. Tonight Georges impeccable taste in women will pay off and Claudia will learn that the fastest way to a mans heart is through his stomach, literally. "BEST CINEMATOGRAPHY" "BEST SPECIAL FX"